A great INXS song, and something that crossed my mind while climbing the biggest mountain in Japan. Ladies & Gentlemen, it's time to meet the one they call "Fujisan", otherwise known as Mt Fuji. Every year I told myself I was going to do it THIS year, but due to circumstances, weather and just not finding willing people to join the "adventure", I kept putting it back. The planets were aligned. I had time to go, and the weather could not have been more perfect. On Monday we caught the 4:50pm highway bus (2,600 yen one way) from the Keio terminal, opposite Yodobashi Camera. During the day it was 36 degrees. I couldn't wait to get away from this heat for a while. The night before I had trouble getting to sleep. There was a mix of nerves and excitement. For the two hour and twenty minute bus ride I was hoping to get a bit more rest but I found myself staying awake. As soon as I saw the first glimpse of Fuji I hurriedly grabbed my camera to capture this moment. Almost everyone starts the climb not from the bottom of Mt Fuji, but from one of the 5th stations. For people from the Tokyo side, the most popular station is the one closest to Kawaguchiko. Arriving about 7:10pm everywhere was dark. There was only one store open selling (overpriced) souvenirs, food and walking sticks. They say that at the top it's about 20 degrees colder than the normal temperature and windier, so we didn't leave until 9pm to time our arrival at the summit as close to sunrise. By 9:39pm, we were already at the 6th station and didn't realize it. The path initially goes downhill a bit before accending so we thought we might be going the wrong way, but instead we were well ahead of time. We arrived at the 7th station at 10:45. Still the climb is quite manageable. This first part of the climb gave us a false sense of security that this climb was going to be a piece of cake. Between the 7th and 8th stations, you are literally rock climbing. Pulling yourself up large size boulders and using your walking stick as leverage, and the chain to pull on as well as roughly guiding the way. I had absent-mindedly left my backpack on the 7th station seat. I was wondering why it seemed easier until 50m up I realized my mistake. It sucked going back down the rocks in the dark, but luckily it wasn't too far away. At each station you can get your walking stick branded for 200 yen. It would've been a nice memento, but I doubt I'm going to send my stick back to Australia. Climbing Mt Fuji at night is the best way. You don't have the sun in your face, and the view of the town lights getting further and further away, people's torch lights and the stars are truly beautiful. Although I had a flashlight, I mostly had it off because there was ample light from the others. I DO strongly recommend a headlamp. I really had to keep one hand free to navigate up. Getting to the 8th station was SO hard. I'm sure I said, "I'm dying" more than a few times. There's more than one 8th station so it felt like we were never getting much further. It's just up and up forever. We would finally be there at 1am. After this point, the track becomes manageable for a while. It's mostly a sandy zig-zag path towards the 9th station. Around here there seems to be a lot more people, probably from converging trails and the inevitable bottleneck as we got closer to the top. My thighs were hurting quite a bit by this stage. I passed by the 9th Station about 3:45. From around this area it was going to be start stop traffic until I reached the top. I was kind of relieved as it gave me a chance to catch my breath. From here on in, it's more rock climbing, but with up to five rows of people wanting to be at the summit by sunrise. I think we all had a little inner panic when we saw day breaking. I passed through a torii gate etched with what looks like hundreds of coins, and then, two white lion statues. I reached the top at 4:40. I easily lost the others climbing up, but what do you know, my cell phone had perfect reception at the top of Japan! The sun finally made an appearance about 4:55 and it was fantastic. Everyone sighed "sugoi" as it went from a semi-circle to a full glowing orb lighting up the mountains and Lake Kawaguchiko below. Most of the way up I was wearing long cargo shorts and a t-shirt. I got hot from all the walking but once I finally stood still, I started getting cold shivers, although I wasn't feeling cold. Strange. I had a hot tea, that warmed my body up, as well as rugging up a bit more, and I felt much better. One of the others was feeling sick from the lack of oxygen so she started to go back down. I didn't want to leave until I saw the crater. It's not so often you get to see inside a volcano! I'd have liked to have stayed longer to walk around the perimeter to the post office (yes there is! ), and to the actual highest point but it wasn't going to happen. About 6:00 I started my way back down the different Yoshida trail. The signs said 340 minutes to get back which made us panic a little. The time is a little incorrect meaning this is the time it takes to the 1st station, NOT the 5th station. It took only 3 hours (and fifteen minutes) for me to get there. Going down was always a 40 degree sloped zig zag trail of volcanic sand. Here is another situation where a walking stick (two's even better) is ESSENTIAL. The sand is very slippery. I only slipped once, but it was one more than I wanted. Much funnier watching others kiss the dirt. It was cloudy on the way down, but thankfully we didn't get any rain at all. At 9:15, we arrived back at the 5th station. Lots of people were around. It's much more lively during the day, and easier to see where everything is. Our bus was booked for 11am, but they let us catch an earlier bus at 10. I think it's easier going down, helped along with gravity, but my knees were wrecked, and I had two massive blisters on my big toes. I wore my most comfortable shoes. Boots are better to stop sand getting in, but don't wear Docs. Some steps on the way up are quite high. It took about three days for me to get back to my normal self. Was it worth it? After I got back I immediately thought not, but now that it's been a while since I got back I'm glad I did it, and if I exercised more I'd have handled it better for sure. Here's a video of my way up. Enjoy. I planned to use my old backpack for Summer Sonic and the Mt Fuji climb. Cleaning out my bag I found a whole lot of things that I'd either forgotten about, or spent ages looking for elsewhere. One was the awesome train map that shows EVERY train in Tokyo and Kanagawa in English and in Japanese. Ever since I had my iPhone though I haven't had as much need for it as before. Another surprise was a completely unopened Ghana chocolate block. The only thing is the due date was "2009/10". I hate wasting chocolate, so I checked on the internet if it's ok to eat old chocolate. (I also found out how to unstuck two glasses we had together) On most sites it said that it was ok, so I went forth and chowed it down. It was quite dried out, brittle and a paler brown colour but otherwise tasted all right. I hope I don't have to do that again. It definitely wasn't the same as eating a fresh one, that's for sure. After I consumed the whole thing, I found the old Donki receipt where I had bought it. On the receipt it said "2008/11/26". So in actual fact the chocolate was close to two years old. Seeing that made me feel slightly queasier, but now that it's been a while since I ate, I give it the all clear! Last year I had to decide between getting a cheap ticket back home for two weeks, or seeing the 10th anniversary Summer Sonic three day event. The $500 return ticket was too hard to pass up, so I had to forgo the festival. Shame that. There were a lot of great bands playing such as Placebo and Nine Inch Nails. I have quite mixed feelings though about Summer Sonic. On one hand the lineups are pretty impressive, BUT on the other hand, the way they scheduled each band there was inevitably going to be some compromises to how many you can actually see. This year was no different. The best bands were playing around the same, or close to the same time, and because of the size of the location, getting to another stage by start time was no mean feat, even with those buses. The second issue is tickets. The two day ticket "sold out" on the Thursday, and yet the one days were still available? This looks clearly like a grab for cash. Fortunately I managed to get the two day ticket, and at a nice reduced price as well. For those outside of Japan, tickets can be purchased at Lawson (convenience stores) Loppi machines, so you might avoid the uncertainty of buying them over the internet. Another thing that annoys me is the banning of cameras. At events like these, it would be great to take some "real" photos of your favourite bands. I had to resort to using my crappy iPhone quality for photos, which looking at them now pale in comparison to what I could take with my SLR. Ok, enough of that rant. Let's get on with the show, shall we? We got up nice and early to be able to see the opening bands of the day. None of the bands held my attention long enough to stick around. Many people around this time took the opportunity to LINEUP to buy t-shirts from the "OFFCIAL" (lol) goods stands. By the end of the festival, there weren't too many shirts left. A lot of Japanese wore their Summer Sonic t-shirts from this year, and past years gone by. To me it's like wearing a Brisbane shirt in Brisbane, but I digress. General Fiasco kicked off a great set on the Mountain Stage. For a three-piece, their sound was really full and they oozed a fair amount of stage presence. It Hurts to watch this band (With a name like that, it's kind of like, asking for it). I heard their songs, "Better than Love" and "Wonderful Life" prior to coming here, and I REALLY wanted to like this band. The lead singer did a lot of strange "flourishes" with his hands. It came across as a more gay BROS (if that can really be possible). Their backup singer looked way out of place looking like a supper club waiter. I liked their 80s sound (could use a guitar though), but too many overblown ballads. "Sunday" has a nice Killers kind of vibe though, if only the singer took stage presence tips from Brandon Flowers. Better still, go see The Killers. They're absolutely awesome live. Yes Giantess had a nice disco sound reminiscent of early Michael Jackson, but a lot of their songs sound quite similar. Maybe they should change their synth presets a bit more often. Not a bad set though. Jasmine and Maika had their times switched around. I prefered Maika's performance more than Jasmine. She had a Japanese "Alannis Morissette" vibe going on, whereas Jasmine was a wannabe Beyonce, incomplete with distracting (not in a good way) dancers. We made our way back to the Marine Stage stadium to watch Eikichi Yazawa. For a 60 year old, he kicked off a rocking set and it was obvious he is revered among the Japanese. It was quite bizarre watching everyone throwing their towels though during his set. What's up with that? On the Beach Stage one band that I'm recently really digging was Clammbon (クラムボン). The singer has a really unique voice. Slightly similar to Chara, so much that the first time I heard this group I thought it was her. These guys have a bit more of a jazzy freeform sound, which live was a bit hard to get into. Want to know if you'd like them too? Listen to "Folklore" and then "Chicago". What do you think? Next we watched Nickelback. I had to confirm how much I dislike this band. Yep, still do. Even before they came on stage, I saw the wall of guitar speaker cabinets. Nothing wrong with that if the songs are any good. I liked "How You Remind Me" when it came out, but any band that starts a song with, "I like your pants around your feet" has lost me forever. Please learn a bit of street cred from Slash. Arigatou. One of the big lures for me to this festival was a-ha. Being a kid of the 80s, I grew up with their hits, and hearing that they were disbanding, I had to see them live. Morten has a great voice but he was struggling with his foldback earphones and looked uncomfortable. They played a lot of new songs which didn't do them any favours. The hits sounded great. I was hoping for "Manhattan Skyline", but it never came. A little disappointing. We had a nice break after them, so we chilled with some African kebabs, while watching The Offspring on the live video feed from the Marine stage. I saw them many years ago back in Oz, so not a big loss there. We caught the end of Richard Ashcroft's set singing "Bittersweet Symphony". It sounded great. I had to choose between Jay-Z and Smashing Pumpkins (Thank you organisers). I knew more Pumpkins songs so that's where we went. Like a-ha, the hits sounded awesome, but his newer material pales in comparison as well. Interesting ukelele bit. He worked the crowd well. Instead of catching the last set by Orbital we went home. Day one was more consistent, but the second day had a LOT of filler. If it hadn't been for Stevie Wonder and Slash, I probably would've done just the first day. I was hoping to arrive in time for Monkey Majik, but we only just got there at the end of their set. Damn. K'naan did nothing for me, neither did My Passion coming across like a bad "My Chemical Romance". Surfer Blood weren't too bad, but it didn't hold my attention long enough to stick around. That's the nature of the music fest I guess. In the lull, she got a t-shirt. I probably should have got one too, but none of them were calling out to me. Next Orianthi. I can't help but think that without her "break" in Michael Jackson's band, she wouldn't be at the level she is now. She's not a bad guitarist. Her instrumental, "Self Esteem" certainly has some nice "Vai"-isms, but I felt like she's still finding her feet. "Bad News" sounded like "Get Me To The Bathroom". Go figure. I don't think she has commanding stage presence just yet. Having said that.. Big Bang made Orianthi look like the next best thing since sliced bread. This Korean boy band were woeful. They have a lot of young adoring Japanese fans, but it's hard to sing and dance without microphones, right guys? Good thing ripping off the kids too with 4,000 yen plastic necklaces. Sheete. SUM 41 had the arena floor fill almost to capacity. They sure had a lot of fans. I only knew "In Too Deep". Not my kind of music but what they did, they did well. Courtney Love of Hole probably still has a hard time shaking the "Mrs Cobain" stigma. No one is going to say she has a good voice, but she put in a good enough performance with "Malibu" and "Celebrity Skin" hitting the high points. Had a super quick look at Black Rebel Motorcycle Club, before making my way to see Slash. I have to say it right now. Slash was hands down the best performance of the weekend. Ably helped along with fantastic vocals from Myles Kennedy, I was enthused from the very beginning. Usually when the singer is replaced, the remaining guys feel like a cover band (eg. INXS, RIP Michael). In this case, when I heard a G'N'R tune, I believed I was hearing Guns and Roses! It just goes to show Slash was just as much G'N'R as Axl. His solo record material killed as well. I wished I could've stayed till the end of the set, if it hadn't have been Stevie Wonder I wanted to see. It didn't help that Stevie Wonder got on stage a whole twenty minutes late. What can you say about Stevie? He was in fine voice. He knows how to work a crowd. His sing-a-longs sometimes were hit and miss with a mostly non-English audience. He attempted to get us all to sing Jay-Z's, "Empire State of Mind", which even I didn't know the words to. All was forgiven when he got us singing, "I Just Called To Say I Love You". Corny as ****, but everyone could sing this. I DID get a little bored with the ballads, and was thinking of Dream Theater that I was missing on another stage though. We made our way out when the end was near, to make a quick bus dash to see The Pixies. I only had to hear one song, "Debaser", and I was able to go home satisfied. This summer I didn't want to miss a fireworks show. 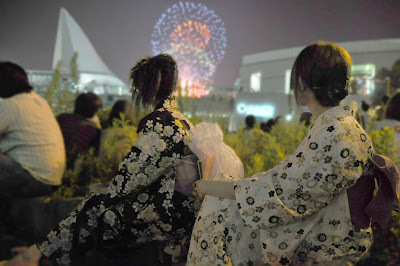 We were going to go to the Adachi fireworks in Kita Senju but it didn't end up happening, and the Sumidagawa fireworks were on the same night as a party I said I was going to. So, I made sure we would go to Yokohama's Kanagawa Shinbun. We went last year and I really enjoyed it. Last time we were a little far away, with the Intercontinental hotel blocking some of the view. This year we hoped to get to Rinko Park, much closer to the action. Unfortunately a lot of other people had the same idea, so instead we, along with many others sat down on a closed-off road just outside the Pacifico complex which gave an almost unobstructed view. This time we brought some cracker and cheese snacks, along with some limited edition green tea Krispy Kreme donuts we bought nearby. Of course I had the mandatory chu-hi to celebrate the spectacle. I also brought along my tripod this time to avoid camera shake and "alcohol hands". I took a LOT of photos. They turned out much better than last year. But due to the unpredictability of fireworks, the best came about solely by chance. Here's a few.